The conflict that erupted in South Sudan at the end of last year triggered sudden and massive changes throughout the fabric of South Sudanese society. It has inflamed the political and ethnic fracture lines that already existed across the country, resulting in gross human rights violations and adding pressure to an already challenged justice delivery system. Nevertheless, IDLO believes that justice sector institutions, particularly the Judiciary of South Sudan, have a vital role to play in upholding and strengthening the rule of law, and ensuring accountability and reconciliation despite the immense challenges facing them. 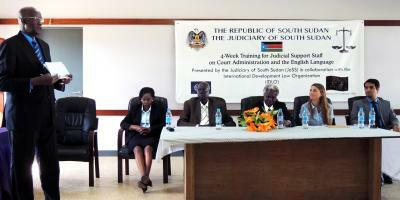 With support from the European Union, IDLO is working to build a fairer, more robust and more transparent justice system in South Sudan by delivering a series of context-specific training courses to 150 newly-appointed judges and judicial support staff. Judges and support staff from all over the country are being trained in substantive areas of the justice system. These trainings also place a great emphasis on English language skills and judicial vocabulary. Language is a barrier to the administration of justice in South Sudan. Most litigants who appear in South Sudan’s courts do not speak English, though South Sudan’s Transitional Constitution, laws, and appellate decisions are all issued in English, the official language of the new country since 2011. By ensuring that legal professionals have the necessary skills to work in the new English-language common law system, IDLO is increasing the capacity of the judiciary to interpret and administer justice, benefiting the citizens of South Sudan. IDLO believes that if justice services are delivered in a fair, efficient and equitable manner, the Judiciary of South Sudan can build confidence in the rule of law and contribute to bringing lasting peace and stability to South Sudan.